I was so excited to see another Sophie Kinsella book was coming out! I immediately put my name down on the waiting list at the library, and was shocked when I was notified that the book was ready for me to pick up on the same day it was released! Talk about good timing! 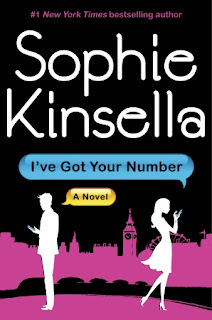 I've Got Your Number is a book with a now classic Kinsella formula: the somewhat ditzy but lovable heroine who gets herself into a pickle, but ultimately wins the heart of the fabulously wealthy and successful male character. And it's set in London, so what's not to love? Our main character this time is Poppy Wyatt, a physiotherapist who, as the book begins, is attending her hen night party in advance of her upcoming wedding to the somewhat condescending Magnus. Poppy is immediately thrown into turmoil from the first page as her engagement ring (a family heirloom) goes missing in the midst of a fire alarm at the hotel where the party is being held. Unable to get a signal on her cell phone (which she's using to try to alert everyone to her predicament -- well, everyone except Magnus), she runs outside to see if reception is better. Distracted, she is totally unprepared when a thief on a bike rides by and steals her phone from her outstretched arm. In a complete panic now, she runs back into the hotel lobby, and as she's passing a trash can, she notices a discarded cell phone. Since she's currently in dire need of one (to be available for messages in case her ring turns up), she decides to "borrow" this phone for the time being. The phone turns out to have formerly belonged to the Personal Assistant of Sam Roxton, head of a global corporation that happens to be holding an event at the same hotel and at the same time as Poppy's hen party. It turns out that Sam can't be bothered to receive messages himself (neither business nor personal), so Poppy makes an arrangement with him: she'll forward all his emails and messages if he will only let her keep the phone until her ring is found. Of course, this might have been a very bland book except for the fact that Poppy can't keep from reading Sam's messages and eventually replying for him. Sam is a somewhat gruff and detached person, but the emails from him that are sent by Poppy interact with employees and acquaintances in ways that Sam never did before. While Poppy's interference causes Sam some embarrassment, it also allows her to become a major player when a looming scandal threatens Sam's company. Meanwhile, Poppy is preparing for her wedding. Magnus comes from a family of high-achieving intellectuals, and Poppy has to deal with feelings of anxiety and inferiority whenever she comes into contact with them. Shortly before the wedding, she receives an anonymous email that causes her to re-evaluate her entire situation. I've Got Your Number is an engaging and fun read. Poppy is thrown into messes, largely of her own making, but is able to overcome every obstacle with her own brand of spunkiness and ingenuity. Her determination to do what's right for everyone (whether they want it or not) is just one of the aspects of her endearing personality. If you're looking for a light read that will leave you with a good feeling, this is the book for you! Interestingly, there was a somewhat negative interview (well, the interviewer was negative, Ms. Kinsella was nothing but charming) with Sophie Kinsella recently in The Guardian which resulted in a follow-up commentary defending Ms. Kinsella and all things "chick lit."